We arrived back in St. Paul, Minnesota on a cold December afternoon, after spending a week enjoying the comparatively mild weather of Paris, France. In Paris, we joined tens of thousands of people, including around 150 world leaders, who convened on the quiet Parisian suburb of Le Bourget as part of the United Nation’s 21st Conference of the Parties, or COP21, to negotiate an international climate agreement to fight global warming. We didn’t know it then, but what would become known as the Paris Agreement was finally worked out and ratified on December 12, 2015, one week after we got back to St. Paul. I had the opportunity to attend this COP negotiation to conduct research with my university, Macalester College in St. Paul, Minnesota. At COP, I was interested in finding the “unsung heroes” of climate action. I was looking for those people or organizations quietly working behind the scenes and below the formalities of the international delegations to advance action against global warming. It wasn’t long before I found what I was looking for: cities. 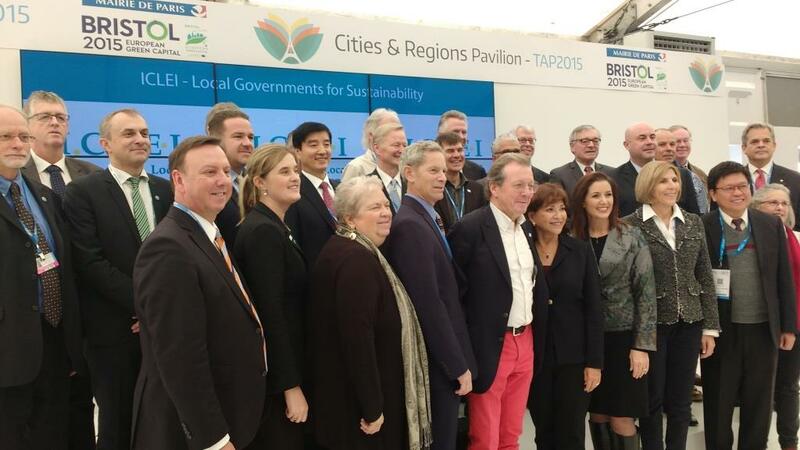 City leaders at the Cities & Regions Pavilion in the Climate Generations Areas at COP21. They’re probably the last thing one would think of at an international negotiation. Nonetheless, cities were very present at COP21. Discussions on local action seemed to follow me everywhere. Cities had their own pavilion in the Climate Generations Areas, next door to the negotiating zone. The Climate Summit for Local Leaders was convened on December 4th at Paris’s City Hall, where nearly a thousand city leaders met and agreed on action steps. One morning, after passing through security and checking in for the day, I walked aimlessly across the convention hall, and stumbled upon the mayors of Bristol (UK), Sydney (Australia), Addis Ababa (Ethiopia), and Rotterdam (Netherlands) speaking about urban resiliency at a panel discussion. COP veterans who have been at many conferences before told me that the focus on cities is relatively new; even a few years ago, there wasn’t this intense focus on the actions of local entities. After speaking to a number of experts and mayors themselves, I began to understand why the world is turning to cities to lead the way in continuing the climate fight. Cities are in a unique position for dealing with climate change: They are the world’s main carbon emitters, emitting around 70% of the world’s carbon, according to UN Habitat. This means that their actions can have significant effects on reducing emissions worldwide. Cities also feel the impacts of climate change especially acutely, and will be at the forefront of future adaptation. On top of it all, it is predicted that by 2030 over two-thirds of the world’s population will live in cities, giving cities even more power to take significant action. Aside from individual commitments, cities are pledging to take action together, as the Climate Summit for Local Leaders on December 4th demonstrated. It was a busy day for those who attended. Nearly 1,000 local leaders met and signed the Paris City Hall Declaration to reduce emissions, reinforced an earlier Compact of Mayors with ambitious emissions targets, and supported groups like ICLEI-Local Governments for Sustainability, C40 and 100 Resilient Cities, all while national delegations continued to debate across town at Le Bourget. 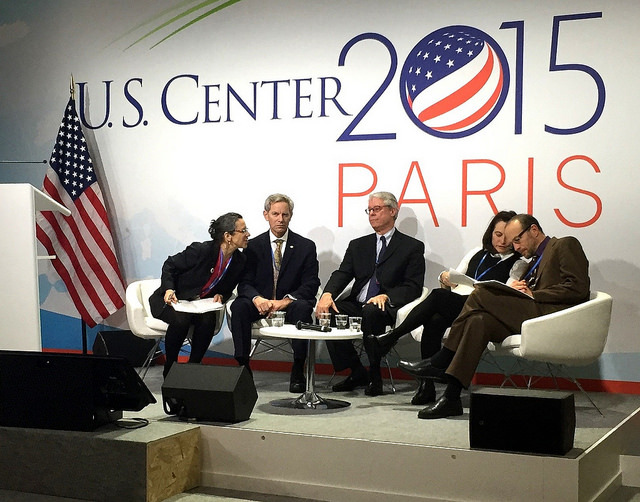 Mayors including Libby Schaaf at the U.S. Center in the COP21 negotiating zone. Finally, cities are the places where much of the national climate action is implemented. With the vast majority of people living in urban areas, climate action cannot be effectively undertaken without involving cities. “After the agreement is reached, who’s going to be the first to start implementing that? It’s going to be the mayors at their desks the next morning,” said Jeffrey Sachs of Columbia University’s Earth Institute, “so literally where the rubber hits the road is the world’s cities.” When our class left Paris after the first week, the outcome of COP21 was far from certain. At that time, there was so much left to be negotiated, with hundreds of brackets remaining in the draft text. Many were skeptical that an international agreement would ever be reached. A week later, on December 12th, while all eyes were on the international delegations as the historic Paris Agreement was signed, the mayors of the world’s cities quietly began another day of work, likely feeling proud of their role as the unsung heroes in the fight against climate change. Chris Pieper is a student at Macalester College in St. Paul, Minnesota.